The simple pleasures in life are often the most neglected. Too easily they’re overlooked in favour of costly or complex adventures. Like fancy restaurants, round the world trips, designer accessories….I’ve been thinking a lot about the simple pleasures as I embark on a 12 month career break from work. Squeezing more of them into my now time lush weekdays is my aim. The first step to finding more moments of happiness is to be aware of those simple things that bring you pleasure. You can then build more of them into your everyday, and have greater gratitude in those moments. Top of my list are peaceful reading time, feeling the sun on my skin, home cooked meals, Game of Thrones, long hot baths and butter. Butter? Yes, butter is one of life’s edible joys. Give me a few slices of sourdough toast and a slab of good quality butter and I’ll happily savour every bite. The quotes featured here suggest I’m in good company. I called this post ‘Top Reasons to Love Butter’ not just because (for me at least) it’s one of life’s simple pleasures, but also because it’s healthy – bringing benefits that go way beyond happy taste buds. For too long butter was demonised as being packed with naughty saturated fat. Butter fans the world over converted to margarine. But many are now switching back safe in the knowledge that butter is actually good for you. Don’t take my word for it – Google ‘Is butter good for you?’ and you’ll get a feel for the benefits of butter in moderation (and the dangers of processed margarine alternatives made from oils that have been hydrogenated). There is one downside to being a butter lover – butter is tricky to spread unless you’re always thinking ahead and remember to bring some to room temperature. Which 9 times out of 10 I fail to do. More often than not this leaves me frustrated with cold hard butter that doesn’t want to go anywhere. That’s why I’m ‘spreading’ the word here about a genius product I came across when looking for a way to avoid wrestling with hard butter. 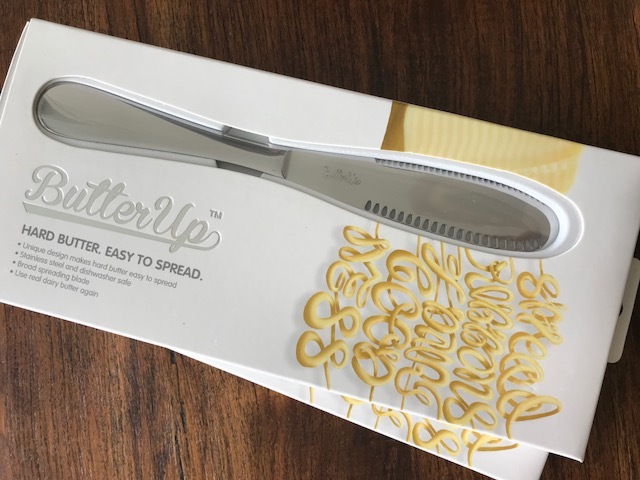 It’s called ButterUp and is the knife that promises to solve common butter dramas. I was about to place an order when the kind team at ButterUp sent me a complimentary knife to trial. 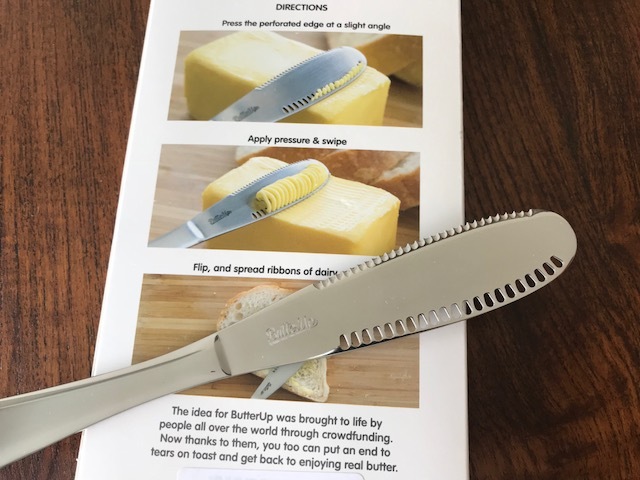 I’m pleased to report that my new ButterUp knife makes light work of spreading cold hard butter. It’s all thanks to a clever design that features grooves on one side and small holes on the other. You can check out more on this clever kitchen companion here and place an order online. Back to the simple pleasures in life. I couldn’t resist sharing here a tail I often reflect on. It’s called the The story of the Mexican Fisherman (featured on a blog called ‘bemorewithless’). Take two minutes to read it and let me know your thoughts! Tags: benefits, butter, butterup, good for you. Bookmark the permalink. Just a query, Laura. 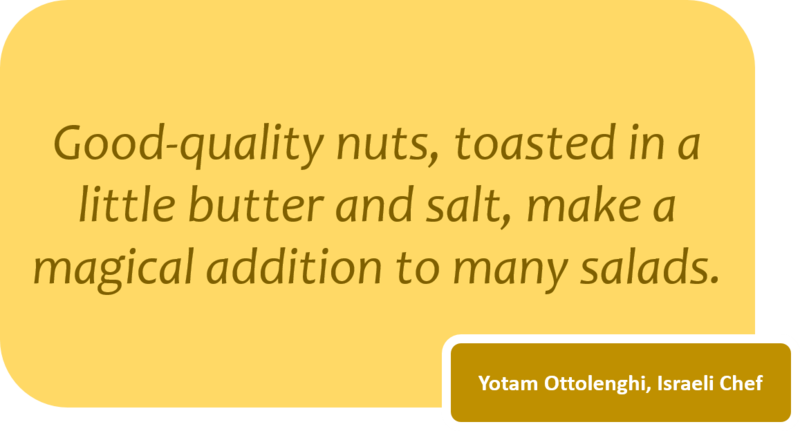 Have you tried and do you have an opinion on the tubs of soft spread butters? Some of them are a mix of butter and olive oil. Hi Mary, I haven’t tried the mixed products – but a mixture of real butter and olive oil sounds so much better than margarine products…..
Laura! I truly love your post. And… I love butter. I remember when I was kid, my grandma used to do butter at home and I was excited and impatient to have a fresh butter with good piece of bread and pinch of salt. And I was happy… I went back to books, “science kid’s” stuff and came back for other piece. I can eat it over and over. I am not big fan of margarine, however good butter is always in my fridge. Hi Vero, thanks for your lovely words. I am so impressed that your grandma made her own butter – and you like me seem to cherish good bread and butter! Also so nice to here about your ‘enough is enough’ break – makes me feel better knowing others have dived in and come from a break feeling refreshed. In that case I won’t rush into the homemade butter making! I can’t believe we were conned for so many years into thinking margarine was better for us! My mother used to say that bread was properly buttered when you could see your teeth in it, and she lived to 98. Liz – well what more can I say other than I love your mother’s saying – now seeing your teeth in the butter requires a generous spread. And tell me about the margarine diversion – I’ve had to educate my own mother to revert back to butter – which I am happy to report she did a few years ago. Bring on the butter I say! Yes to butter! I also love the story of the Mexican fisherman. Great post! So good to hear you’re also a butter fan and also that you like the Mexican fisherman story – it’s one I have wanted to share for a while…. Thanks Kay for stopping by and sharing your feedback….always good to hear from fellow butter fans! I never switched from butter. It’s one of life’s pleasures for sure! I remember a quote from Joan Dye Gussow, “I prefer butter to margarine because I trust cows more than I trust chemists.” I don’t usually use much butter, though, except when I bake but every now and then a piece of toast spread with butter! So good! I love this knife! Also – The Mexican Fisherman. Lovely!! Mollie – what can I say your butter quote is fantastic – sums up the matter in a nutshell. And good to hear that you stayed well and truly on the smooth butter path. You should spread more butter – from what I have gathered it’s pretty good for you! I never knew that there was anything good about butter, so now I shall spread forth with no guilt!! Couldn’t agree more Petra – I’m glad you’re on the butter bandwagon too! Hi Jenny – so glad my post has helped rid you of any butter guilt. And I’m with you on going for top quality butter – I stick to grass fed / organic and am happy to pay a little more for a better butter! Hmm, what a cool butter knife! Yes, butter is good for you, and I’ve never purchased margarine. Mother never did either, and in her eyes she didn’t use it every day, or even every other day, so why buy something inferior in taste? And now we know butter IS good for you as well as just being, well, good. Thanks so much for your butter support! What do they say – something along the lines of mother always knows best…..
You are preaching to the converted – I adore butter! We are enjoying Lurpak at the moment and having it on fresh sourdough is heavenly.